Million Dollar Quartet tells the story of how record producer, Sam Phillips, brought together the four legendary rock n roll singers, Elvis Presley, Jerry Lee Lewis, Johnny Cash and Carl Perkins, into Sun Studios one December night in 1956 for a what would become one of the most famous jamming sessions in rock n roll history. They were, it would seem, a rather disparate group with varied backgrounds but all had been discovered by Phillips through his Sun Records label. Elvis Presley was already a huge star, although he had left Sun and gone over to RCA but he wanted to return to the Memphis studio. Carl Perkins had originally written ‘Blue Suede Shoes’ and made no bones about the fact that he was bitter about Elvis having more success with it than he did. Johnny Cash only managed to get a recording contract with Sun after he switched from gospel to rockabilly and had already had hits with ‘Folsom Prison Blues’ and ‘I Walk the Line’ by the time the impromptu jam session came about. The least known of the four, at the time, was Jerry Lee Lewis. He was a session musician for the studio but with his extraordinary style of piano playing, it wasn’t long before he would have a string of hits that would forge his rise to fame. Million Dollar Quartet brings that legendary night to life and features a score of rock hits which bring you inside the recording studio with four major talents who came together as a red-hot rock 'n' roll band for one unforgettable night. Million Dollar Quartet includes more than 20 legendary rock ‘n’ roll hits, including ‘Blue Suede Shoes’, ‘Hound Dog’, ‘I Walk The Line’ and ‘Great Balls of Fire’. Based solely within the recording studio of the Sun Studios building, Jason Donovan plays Sam Phillips in which he documents the relevant moments leading up to the quartet meeting. This is done in a partly narrative style with flashbacks re-enacted within the studio setting. To be fair, it can’t have been easy for the writers of this production to create a show from just a one night session and the dialogue doesn't always sink in at times, to the point that you don’t really understand the relevance of the whole thing until at the end when the original photo is shown of the real musicians taken on that night. It’s then that the goosebump moment comes when you realise that this was actually a really big deal. What essentially makes the evening spectacular is the skill and talent of the actors playing the parts of these legendary musicians. Ross William Wild as Elvis has all the mannerisms of what must have been Sun’s greatest discovery - close your eyes and listen to him singing and he is absolutely spot on. Mathew Wycliffe as the, perhaps, not so well known Carl Perkins is fabulous with some really great guitar playing and Robbie Durham is so uncannily similar to Johnny Cash not only in looks but with that wonderfully deep and resonant voice. The stand out performance though, has to go to Ashley Carruthers as the cheeky young upstart, Jerry Lee Lewis, who really gets to show off his piano playing skills. All of these guys are massively talented musicians and everything is played live on stage. Katy Ray as Dyanne, Elvis’s girlfriend also gets a chance to shine with some very impressive vocals. Despite the fact that this was a night where history was made, the writing never really gives this production the theatrical dynamics to emotionally invest into the characters which is a shame, although things do pick up a bit during Act 2 with some interesting insights into each of the singer's backgrounds. This show is without a doubt more about the music than the storytelling. A highlight to the night is when, after the bows, we are treated to a kind of mini concert, which really gives the guys a chance to show off their playing skills and has a hugely appreciative audience up on their feet, dancing, singing and clapping along. Something that I really didn’t appreciate, is that there are a lot of people out there who are clearly huge fans of rock 'n' roll and all that encompasses that 50s era. 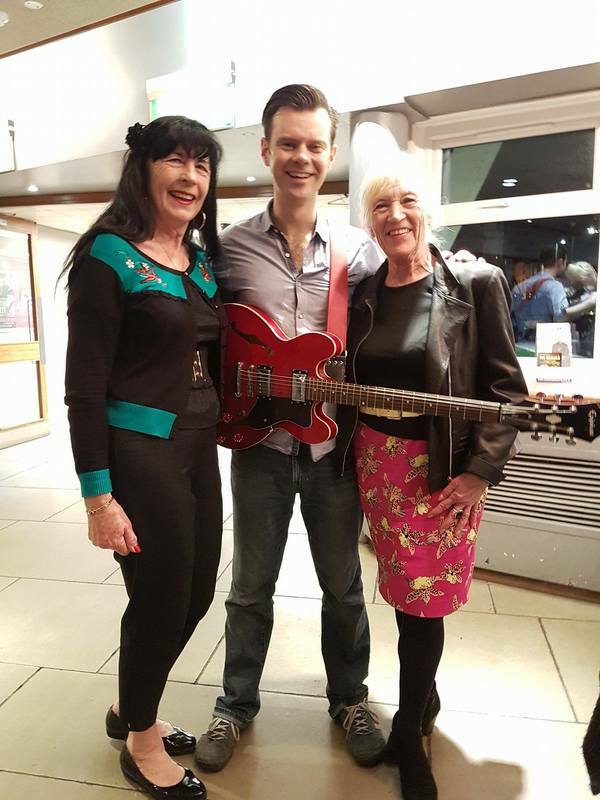 Looking around at the Cliffs Pavilion’s opening night audience for Million Dollar Quartet, you could sense that there were a lot of people either enjoying this trip down memory lane or simply just taking in this musical history lesson. Whichever way you look at it, you'll be treated to a great night of rock 'n' roll and the Southend audience certainly didn’t look disappointed.